Jeff Stilson directed Good Hair (2009), which stars Chris Rock (top still) as narrator and interviewer, investigating African American hair products and styles. The film showcases Rock's warmth and good humor during a myriad of face-to-face encounters with those who spend money on attaining "good hair" and those who make money providing it. Men in a barbershop (middle) have an opinionated exchange, for example, captured well with a wide angle lens on the camera. A trip to Chennai, India (bottom) shows where human hair weaves come from. The recent death of cellist David Soyer brings to mind Allan Miller's High Fidelity: The Adventures of the Guarneri String Quartet (1989); Soyer was a founder of the group. The film highlights personality and communication while also including entertaining "rockumentary" staples such as the group's origins, lifestyles, and behind-the-scenes conflict. The film closely observes lively interactions in rehearsals and on the road (middle still, above, a passionate debate among three members of the quartet). The final scene in the film emphasizes that the music, and musicianship, is the key to the Guarneri's longevity and renown: a mesmerizing live performance of the last movement of the third Rasumovsky quartet (Opus 59, No. 3) by Beethoven. Extraordinary editing of this sequence (and the film as a whole) by Thomas Haneke conveys the excitement of the music and the energy of the musicians. Robert Frank, in his short film Conversations in Vermont (1969), states that "this film is about the past and the present." Music by Bessie Smith plays over views of contact sheets (top); Frank holds the microphone (Ralph Gibson was the cinematographer) while hanging out with his son Pablo and daughter Andrea. The film is a lovely record of a father beginning to recognize that his children are growing up. Andy Warhol, in a 1967 interview with Gretchen Berg, said, "There’s nothing really to understand in my work. I make experimental films and everyone thinks those are the kind where you see how much dirt you can get on the film, or when you zoom forward, the camera keeps getting the wrong face or it jiggles all the time: but it’s so easy to make movies, you can just shoot and every picture really comes out right." Warhol's comments apply to lightweight devices that shoot video, such as the Flip and the iPhone. They're really easy to use, and one can turn them on and just shoot. The problem is that these cameras do jiggle all the time when they're hand-held. Do audiences assume that documentary films are the kind where the footage is always bumpy, as parodied in "The Office" and other shows? Amir Bar-Lev's My Kid Could Paint That (2007) is a film that reveals more about making a documentary than about its subject, a four year old painter named Marla Olmstead whose paintings attracted attention in the bubble-icious art market of the mid-2000's. My Kid Could Paint That raises meaty issues about documentary representation of characters and events. College students in a recent journalism ethics workshop, for example, analyzed the queasy relationships between the filmmaker and the filmed. The students picked apart elements of the story that showed the filmmaker's control over shooting and editing (above, Marla's parents' body language during a heated discussion appears to show them moving apart). Microcosmos: Le Peuple de l'Herbe (1996), by Claude Nuridsany and Marie Pérennou, is an unusual nature documentary. 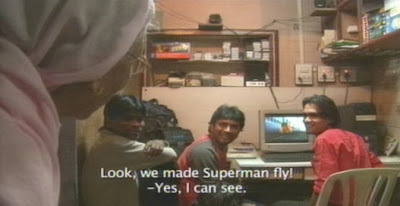 The film observes insects so intimately that they become protagonists in a series of miniature dramas. Romance, competition, violence, metamorphosis, and triumph are depicted over the course of a day. Vivid audio recording and sensitive close-up photography bring us into meadows and ponds that overflow with otherwise unseen activity. Artist and photographer Man Ray's experimental short film, Emak-Bakia (1926) centers on abstract spinning forms, bright lights, and other forms in motion. The film has some occasional human references, such as the dancer, above. One scene in Emak-Bakia with a woman's face (middle still) reminded me of Man Ray's 1936 photograph (bottom still). The Basque title has been variously translated as "leave me alone," "don't bother me," or "who cares." Shola Lynch documents the excitement and promise that accompanied the (unsuccessful) presidential campaign of New York City congresswoman Shirley Chisholm in Chisholm '72: Unbought & Unbossed (2005). The documentary has exciting archival footage as well as insightful interviews with key figures of the 1972 Democratic primaries and convention, including Chisholm herself (above). Both the African American establishment and the feminist movement seemed threatened by Chisholm, who herself never seemed to have any doubts that she'd make a great president. Three minutes of unedited camcorder footage from Cameron Indoor Stadium's student section shows the communal thrill of an at-the-buzzer game-winning basket made by Duke's Sean Dockery in December of 2005. Despite its you-are-there feel, the video is most useful as an example of the unintelligible visual abstraction that is a byproduct of shaky handheld video shooting. Emile de Antonio's Painters Painting: The New York Art Scene 1940-1970 (1973) is a film about artists done by a political filmmaker, which gives a heft and seriousness to the subject. The history of the twentieth century grounds the film by providing a continuous invisible counterpoint to all the talk about art. Seeing famous artists in their heyday makes the film into an art history textbook come to life. From the top, Kenneth Noland, Andy Warhol (surrounded by the documentary crew), Helen Frankenthaler, and Willem de Kooning. Leonard Feinstein's Inhaling the Spore: A Journey Through the Museum of Jurassic Technology (2006) is a worthwhile substitute for visiting the actual museum, in Los Angeles. The film brings to life Lawrence Weschler's book, Mr. Wilson's Cabinet Of Wonder: Pronged Ants, Horned Humans, Mice on Toast, and Other Marvels of Jurassic Technology. Interviews with Ricky Jay (top) and museum founder David Wilson (bottom) are highlights. 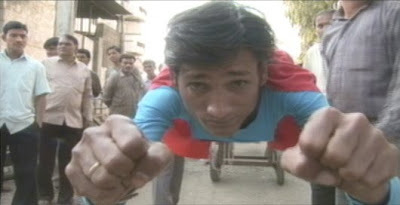 Supermen of Malegaon (2008), by Faiza Ahmad Khan, is a back-stage documentary, showing the making of the decidedly tongue-in-cheek superhero adventure, "Malegaon ka Superman." With a small consumer camcorder and an eye for entertainment value, director Shaikh Nasir shoots his feature using locals as actors. The documentary follows Nasir through the ups and downs of the production process in a hardscrabble town.